David is an astute and results oriented Legal Practitioner. He is the Founding Partner and Managing Partner of Legalstone Solicitors LLP, a modern law firm with expertise in broad areas including oil and gas, corporate and commercial law. Having learned his trade from well-established Practitioners, he has gained an advanced knowledge in broad areas of the law. David is an ambitious, smart and optimistic team player with a proven track record of professing sound and solid legal advice that seeks to assist clients achieve and advance their business objectives. He is quick to adapt and very pragmatic and has a razor-sharp wit and understanding of the law. He has a unique skill set that involves swift resolutions of legal issues confronting his clients in various sphere of law cutting across Energy and Natural Resources, corporate and commercial, Dispute Resolution and Maritime Law. He has acted for both Local and International clients in a variety of fields, including Real Estate and Construction, Oil and Gas, Mediation and Arbitration and Intellectual Property Dispute. 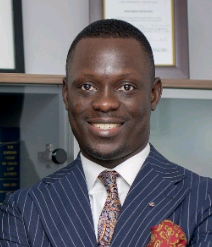 He was the Head of Legal at Generic 7 Consult International Ltd (an Oil & Gas Rig Operation Firm) with its offices in Aberdeen Scotland and Accra Ghana from the year 2016 to 2017. He also worked as a Legal Counsel for the Ghana National Petroleum Corporation (GNPC). David is currently the external Solicitor for HUMANO ENERGY LTD, an Oil Marketing Ghana (OMC) in Ghana. David is described as versatile and energy expert with in-depth knowledge of Ghana’s local content and local participation laws. He has published a number of works on oil and gas related issues. David routinely advises clients on Energy and Natural resources law including regulatory compliance regimes. - Institute of Energy Law (IEL). - Young Energy Professional, Institute of Energy Law (IEL).